World Missionary Press celebrates the beginning of our 57th year. 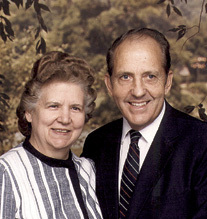 WMP began in the hearts of Watson and Rose Goodman while they were missionaries. 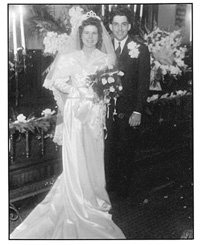 On their wedding day they dedicated themselves to missions. Having died to self and being totally committed to God, they began their 16-year ministry in South Africa. In 1951, they established Gospel Centre Work, a faith ministry, concentrating their efforts mainly on evangelizing the children and youth in neglected black areas. At home, the Goodmans would clear off their dining room table, place a mimeograph machine on it, and run pages with Scriptures and pictures to color for the 2,000 black children they taught weekly in the five townships surrounding Germiston, South Africa. Watson and Rose’s printing progressed to a small printing press in their garage. They began printing the 48-page Scripture booklet Help From Above in the Zulu language, stapling the booklets by hand. Watson’s vision for reaching the world through Scripture booklets distributed free of charge grew in intensity. 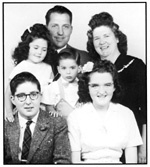 In 1961 God led them to the U.S. to establish World Missionary Press in Winona Lake, Indiana. A small building was dedicated November 11, 1961. 1. To believe God eventually for a million dollars a year. 2. To send out one million Scripture booklets a month free of charge. 3. To print in 300 languages. God’s provision has far surpassed Watson’s first two goals. Income has risen to about $4 million a year. WMP currently prints 7 million Scripture booklets per month for free distribution in 210 countries and islands. The third goal was reached in January 2000 with the production of language number 300 – Hmong Daw for Laos, Thailand, and Vietnam. We are currently printing in more than 345 languages. In 1970 WMP outgrew its Winona Lake facilities, and due to rezoning was unable to expand on-site. Believing that “disappointments are God’s appointments,” the Goodmans searched for a new location. A couple from New Paris, Indiana, who had been driving to Winona Lake to volunteer at World Missionary Press, had been impressed by God not to sell their land in New Paris just yet. When Watson and Rose Goodman approached them about buying the land for WMP’s new headquarters, the couple offered the land at one-fourth of its value, because it was to be used for the Lord’s work. Rose always remembered her precious black children in South Africa, whom she tearfully but obediently left behind. So in 1991, when given the opportunity, she gladly wrote the illustrated children’s booklet, The Way to God. WMP now prints 19 publications, including topical Scripture booklets, Bible studies, and New Testaments. Watson and Rose passed the baton when they retired from WMP in 1987 to begin another work, Enterprises For Emmanuel, producing children’s salvation coloring books including He Is Risen!. However, in January of 2000 EFE closed its doors and publication rights were given to World Missionary Press to produce the coloring books. Watson Goodman passed away in January 2002 at the age of 82. Rose Goodman passed away in February 2006 at the age of 86. On September 14, 2013, WMP’s members and Board of Directors unanimously elected Harold Mack – WMP’s long-time Director of Global Distribution and Director of Information Technology – as president of World Missionary Press, effective immediately. He succeeds Jay Benson, who went to be with the Lord on January 5, 2013 after serving almost 25 years as WMP president. Vicky (Goodman) Benson, oldest child of Watson and Rose, currently serves as WMP vice president. You can read more about Watson and Rose, including their time as missionaries in South Africa and the founding of World Missionary Press, from Footprints of Faith by clicking one of the following links: English or Spanish. For 57-plus years Scripture booklet production and free worldwide distribution have continued through dependence on God and the efforts of staff, volunteers, and distributors, just as Watson and Rose Goodman had first envisioned.